Even though it’s only mid January I’m in need of some spring like freshness in my home. As soon as the Christmas decorations are down all I want to do is buy flowers and make my home look pretty and refreshing. Today I wanted to show you how you can change an area in your home to transform it for spring. The first stage is to pick an area, this may be a coffee table, bookshelf, sideboard or dresser, and take absolutely everything off. You’ll need to start with a clean slate free of distractions. Give the piece of furniture a wipe down if it’s dusty and begin thinking about the sort of items you would like to display. Have a look around your home, what objects remind you of spring and make you feel refreshed? My favourite props to use are hardback books, candles, ceramic pots, house plants, baskets and photo-frames. Make sure that each item complements each other in colour, texture or theme. As this is a spring display its best to avoid dark colours that remind you of winter. Once you have collected your items together you can start adding them to the display. I always start with the larger props that will sit in the background, here I’ve used a medium sized basket, my straw hat from Greece (it reminds me of holidays), a vintage alphabet stencil, a print by Peggy & Kate, and my new calendar. Make sure to add different heights into your arrangement, you can see that the height of my items jump around from left to right which creates more visual interest. Having things in height order or displaying items that are all the same height will look odd or boring. Next, begin placing any medium sized items, or the sort of items that wont be centre stage. You can see that I have used a stack of three books, I always try to use an odd number as it tends to look better. The books all follow the same colour story of blue and yellow, they’re also vintage and the titles fit the springtime theme, my favourite being a 1950’s book about trees. I also added in a brass candle stick with a simple candle - again sticking to that blue and yellow theme. The candle adds a bit more height but also offerers a lovely warm glow. I love using candles in my styling as they add a sense of life to a scene. The final stage is to add in the props that will sit in the foreground, these will probably grab the most attention so take some time figuring our where you would like them to go. I love the pink pot of flowers so I added that on top of the books near the centre. I also added in a white pot as I noticed the scene needed something neutral and my ring dish as I always take my jewellery off at my dresser. Finally a coaster is a must have as I carry my tea around the house! The green mug also compliments the green in the floral arrangement. 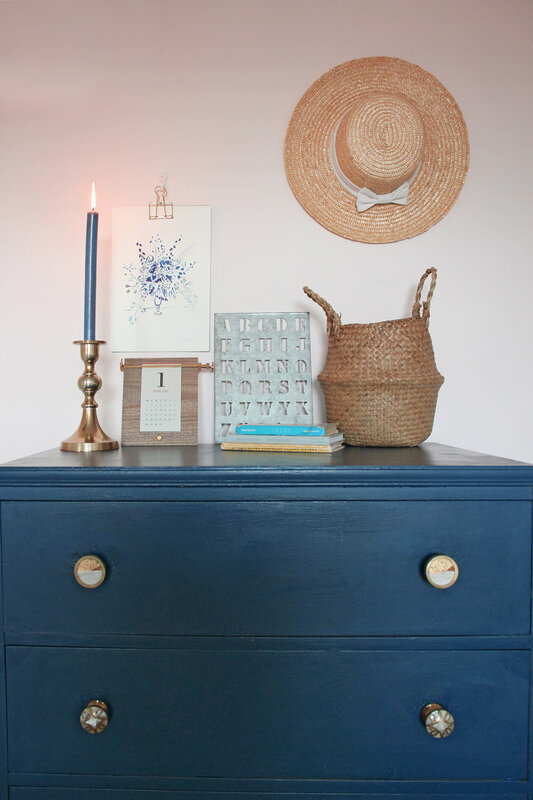 I really hope you enjoyed this post, have fun styling something in your own home this Spring!